Ruby got her big break in July 1919. She was called to New York and offered a three year Metropolitan Opera contract by Giulio Gatti-Casazza. Shortly after signing her contract she changed her name to “Jeanne” Gordon. Her debut performance was as Azucena in Il trovatore. 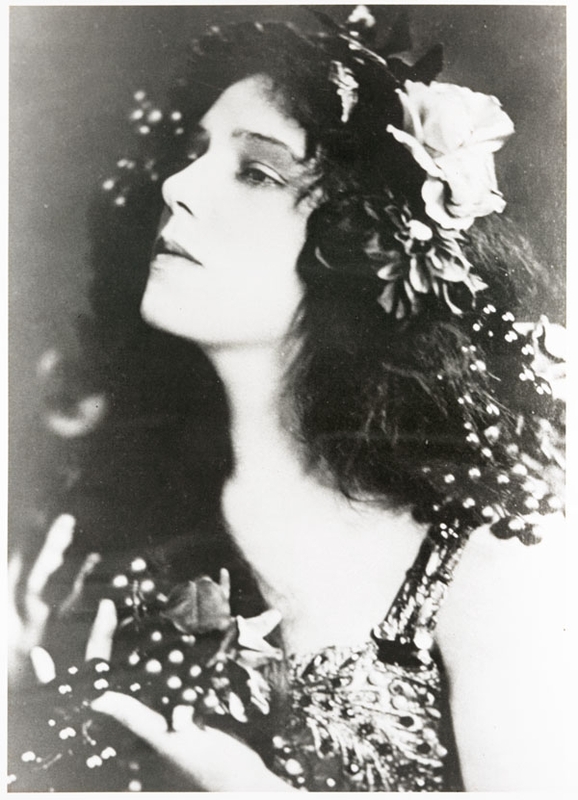 In 1919 she created the roles of the Fairy and Mme Berlingot in L’oiseau bleu by Albert Wolff in its world premiere. She made guest appearances with the Opéra de Monte-Carlo in 1928. Recordings: Gordon recorded 78s for Columbia and Victor in the 1920s. Her only teacher was Albert Ham, with whom she studied while attending Toronto’s Havergal College. As a girl she often sang before Sir Wilfrid Laurier. Married unhappily (1908) to Ralph K. Trix of Detroit, she nevertheless followed him to the USA, but left him in 1917 and began her career as a professional singer in New York. In New York Gordon appeared at the Rialto Theatre, singing operatic ‘interludes’ as part of a variety program. 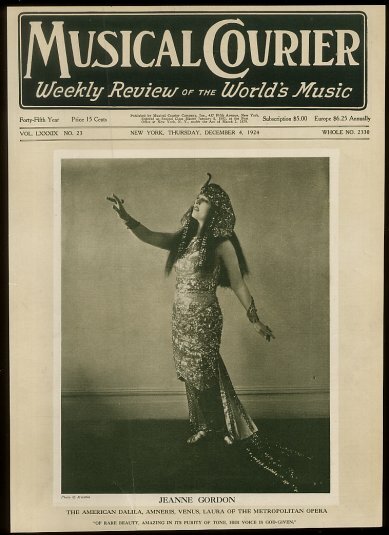 These appearances led to a contract with the Creatore Grand Opera, and she made her debut 11 Dec 1918 in Brooklyn as Amneris in Aida. She toured with the Scotti Grand Opera the following spring and made a highly successful Metropolitan Opera debut 22 Nov 1919 as Azucena in Il Trovatore. She remained a principal contralto with that company for nine consecutive seasons, her repertoire consisting of two dozen roles (in French, Italian, German, and English), including Carmen, Dalila, Eboli in Don Carlo, Marina in Boris Godunov, Brangäne in Tristan und Isolde, and several novelties. She also sang in the premieres of Albert Wolff’s L’Oiseau bleu and Henry Hadley’s Cleopatra’s Night. For virtually all of her opera roles she was coached by Wilfrid Pelletier. Maintaining an active concert schedule she sang in Montreal 11 Mar 1926 on an all-Canadian program under Pelletier with Edmund Burke, Florence Easton, and Edward Johnson and in Toronto 27 Jan 1927 with the National Chorus under Albert Ham. After guest appearances with the Monte Carlo Opera in 1928 in Europe, with the TSO during its 1929-30 season under Luigi von Kunits, and with the Toronto Promenade Orchestra in 1930 under Reginald Stewart (her last appearance), she suffered a mental collapse and was admitted to a Missouri sanatorium, where she remained until her death of a heart attack. 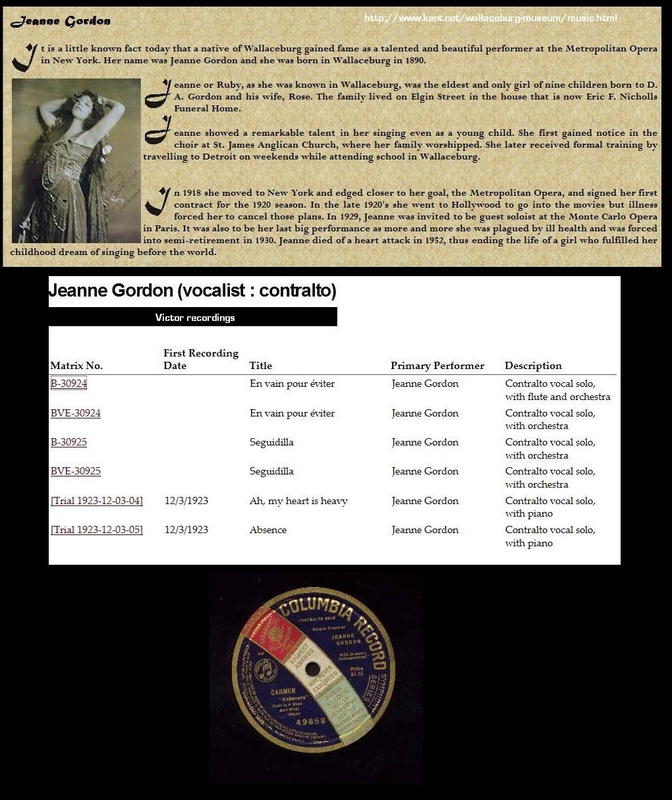 A tall and handsome woman with a magnetic personality and a true contralto voice of extraordinary range and richness, Gordon never quite fulfilled the promise evident in such notices as that published by Musical America after her 1921 Metropolitan appearance as Brangäne: ‘The most satisfactory all-round individual contribution to the performance was made by Jeanne Gordon whose lovely contralto and fine sense of pictorial and dramatic values received thrilling expression’. She recorded nine single-sided 78s for Columbia (1920-2) and two in 1925 for Victor. All are listed in Roll Back the Years. In 1927 she appeared in a few Warner Brothers-Vitaphone shorts, singing operatic excerpts with Martinelli, Gigli, and others. She shares with Edward Johnson and Marie Louise Edvina a Rococo recording (No. 5254) of operatic arias. Found this video with Jeanne Today, from 1927: mezzo-soprano is Jeanne Gordon, BENIA MINO GIGLI, MARION TALLEY, GUISEPPE DE LUCA, SING RIGOLETTO QUARTET. I hope her fans still enjoy her work! To Whom It May Concern: My name is Lorraine Duson, I came across a news paper clipping of Jeanne Gordon at a flee market.